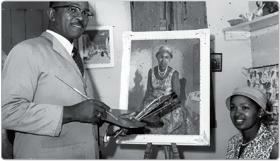 Port Elizabeth artist George Pemba has been honoured with the launch of a memorial that commemorates his work. The memorial - a painting of Pemba with a township background and part of the Sunday Times Heritage Project - hangs outside the late artist's New Brighton home, where a gallery is to be opened early next month. "This is the start of an important phase in the history of our townships," said Motse Mfuleni, events manager of Imbizo Events, the Port Elizabeth company that organised the unveiling of the memorial. Speaking at the unveiling on March 8, Mfuleni said public art was associated by many with "class suburbs and art galleries, not townships", yet Pemba's work reflected society and the community he lived in. "It is a communication vehicle for our people's way of life." Pemba made a name for himself, both locally and internationally, with his paintings of township scenes - initially watercolours and later oils - and the memorial artwork, by local artist Andrew Nhlangwini, is highly reminiscent of Pemba's style. The Sunday Times Heritage Project is part of the newspaper's centenary celebrations, recalling and memorialising events and newsmakers as interpreted by local artists in four provinces. The unveiling was attended by members of the Pemba family, neighbours and business representatives. The artist's grandson, Bobo Pemba, said he was happy that his grandfather was the first artist to be recognised in this manner in the province. He said the event was emotional for the family as it also marked many years of obstacles, adding: "It is no small achievement to have a gallery honouring your grandfather, not for money but to preserve his love for art and culture". He also announced that the George Pemba Art Gallery, in the Pemba home in New Brighton, would be opened on April 2.